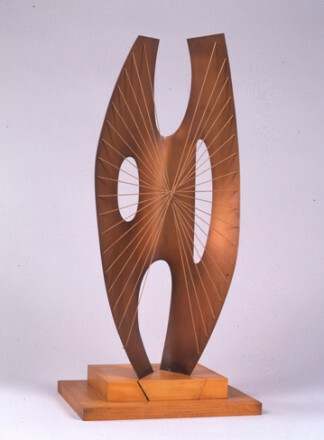 Barbara Hepworth was born in Wakefield, Yorkshire. 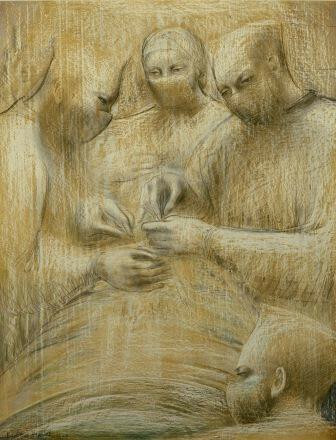 She won a scholarship to study at Leeds School of Art in 1920, where she first met Henry Moore. The following year she was awarded a county major scholarship to study sculpture at the Royal College of Art, London. She graduated in 1924 and was awarded a further scholarship for one year's study abroad and went to Italy where she stayed for two years. She lived first in Florence and then Rome where she learnt the traditional Italian technique of marble carving. 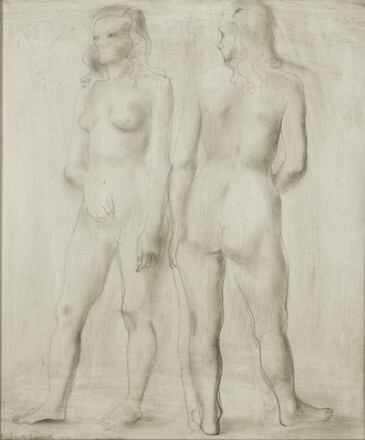 Her first solo exhibition was at the Beaux Art Gallery, London in 1928. As her work moved towards abstraction in the early 1930s, she began associating closely with leading British and European modernists. 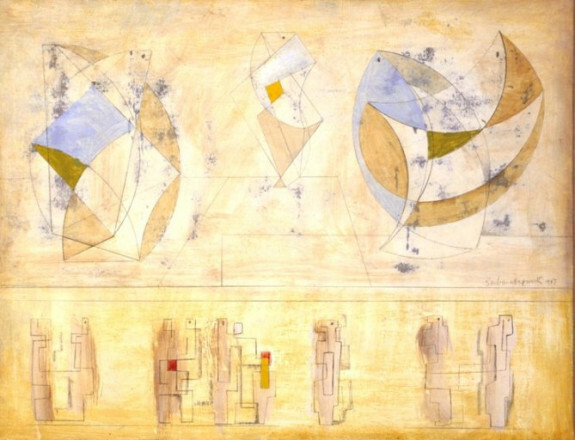 She was invited to join the internationalist group Abstraction-Création in 1933, and the following year became a member of Unit One, a group of progressive artists and architects based in London (Moore was also a member, as was Ben Nicholson). She married Nicholson in 1938 and they moved to St Ives, Cornwall in 1939. 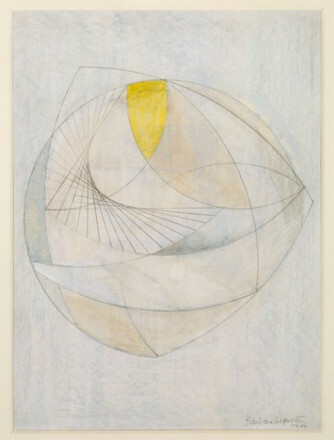 Hepworth's first retrospective exhibition was held at Temple Newsam, Leeds in 1943, and she represented Britain at the XXV Venice Biennale in 1950. During the 1950s she became increasingly established, receiving several major commissions for public sculpture, including a commission for the Festival of Britain in 1951. 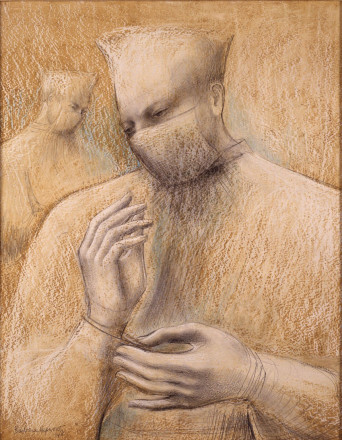 She had further retrospectives at Wakefield City Art Gallery in 1951 and the Whitechapel Art Gallery, London in 1953. Her international standing was confirmed when she was awarded the Grand Prize. 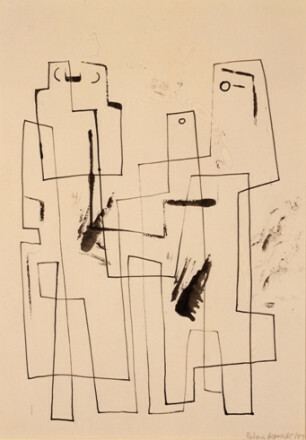 Her early work was concerned with the human figure, developing through abstraction in the early 1930s into sculpture exploring the relationship between the figure and the landscape. The rosewood carving Rhythmic Form of 1949 has the characteristic of an abstracted standing figure whilst at the same time conveying a sense of rhythm and movement through the carving. 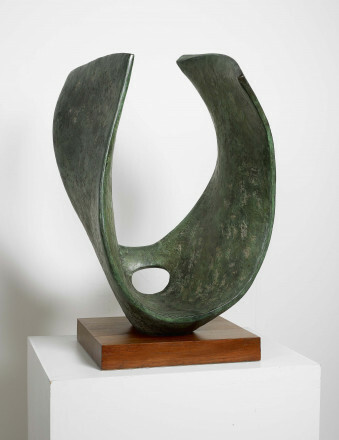 It is also pierced with a hole, an essential element in Hepworth's sculpture from 1931 onwards and a device she used for creating abstract form and space which also united the front and back of the work. Other major developments in her work were in her exploration of colour and in the use of strings for sculpture. The bronze sculptures Curved Form (Trevalgan), 1956, and Sea Form (Porthmeor), 1958, both include Cornish place names in their titles. She had begun to use bronze in the mid 1950s, and for the remainder of her career she divided her work between direct carving in wood or stone and creating sculpture to be cast in bronze. 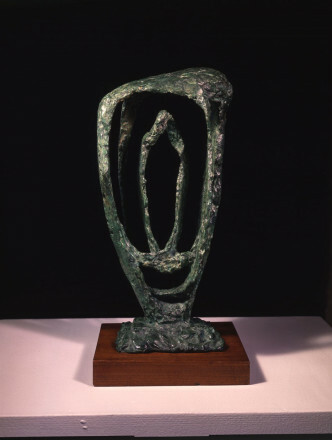 The use of bronze also enabled Hepworth to work on an increased scale and during the 1960s she embarked on an ambitious programme of sculpture series and major public commissions. Maquette for Winged Figure, 1957, was to be eventually enlarged for one of her best known and most prominent commissions, for the John Lewis Partnership building on Oxford Street, London, inaugurated in April 1963.